Taveuni is home to many famous dive sites, including Rainbow Reef and the Great White Wall, both of which are just minutes boat ride away from Taveuni Dive. Below is a description of some of the dive sites. 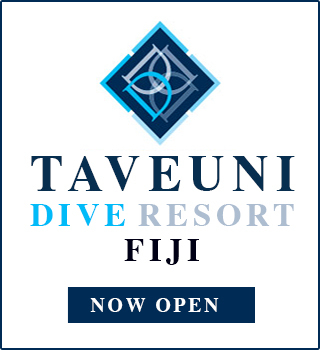 If you would like any further details please feel free to contact “Taveuni Dive. A submerged reef with a depth ranging from 15-120 feet, Rainbow Reef has a variety of soft corals, and large bommies can be seen at the end of the dive. The fish life includes a variety of pelagics such as barracuda, mackerel, travelly, white tip sharks, the occasional leopard shark, stone fish, clown trigger, long nose hawkfish, clown fish, anamones, damsel fish along with a variety of butterfly fish. This site has an outer wall with a tunnel at 20 feet and another dramatic white soft coral covered wall wall at 90 feet dropping away to 240 feet. This site has an outer wall with a reef top starting at 20 feet, dropping away to about 200 foot plus. The wall is covered with purple soft corals, sea whips and large gorgonia fans. A wall with depths ranging from 20-500 feet and a variety of soft coral on the top and side of the wall. Tons of fish, occasional sharks and lots of pelagics cruising by. A submerged reef with a mini wall and a depth ranging from 30-100 feet covered with mostly white soft coral. There are also a large variety of other soft corals. A submerged reef with big bommies allowing divers to weave between them at a depth ranging from 15-70 feet. Includes plenty of soft coral and a variety of hard coral. Schools of fusiliers, basslets, anthiases, Jack travelly, moray eels, leopard sharks occasionally, stingrays and pipefish, are often seen. Has a depth ranging from 30-300 feet with average visibility of 70-80 feet. Includes tons of fish, mackerel, barracuda, jack travelly, sharks (usually in schools), pelagics and there is a large range of soft corals. A submerged reef with depths ranging from 25-120 feet covered with a large variety of soft coral, sea fans, whips, schools of fusiliers, basslets, anthiases and a few bommies towards the end. Has a variety of hawk fish, pipe fish, clown trigger, schools of Spanish mackerel, barracudas, stone fish, nudie branches, Spanish dancer and clown fish. Includes beautiful coral, fans, whips, sharks, barracuda, travelly, tuna, mackerel, unicorn, puffers, anemonies and fusiliers. An atoll that has a vertical drop from 30-1000 feet plus. Has a combination of soft and hard coral, barracuda, unicorn fish, clown fish, anemones, clown trigger fish, groupers, fusiliers and occasionally white tip sharks. An atoll with a vertical drop from 15-1000 feet plus with a mild current which opens up the Golden soft coral, also cannons at 50 feet. Golden soft coral, sea whips, anemones, clown fishes, unicorn fish, occasionally schools of barracuda and white tip sharks. An atoll 15 miles off Matagi Island with a vertical drop from 30-1000 feet plus cannons and a swim-through at 30 feet with beautiful hard coral at 30-40 feet. Most famous for soft corals and pelagics. Plenty of soft coral, fusiliers, schools of barracudas, occasionally surgeon fish, schools of bronze whalers, golden anthiase, unicorn fish, schools of jack trevally at all times and queen angels are seen quite often. Located at the tip (Corner) at Laucala Barrier reef ranging from 30-70 feet to the top of the wall and a vertical drop off, with a variety of soft coral and sea whips on the wall. Clown trigger fish, unicorn, anemone fish, soft coral, fusiliers, surgeon fish, sea whips, sea fans, nudie branches and Spanish dancer, occasionally schools of sharks and barracudas. Fish life of every kind and sharks, humb headed parrotfish, tons of soft coral and beautiful hard coral at 25-30 feet.